Enter your information to find your current officials and the candidates running in the upcoming election. Our Toolkit includes voter registration, absentee ballot and early voting information. Connect with your candidates' social media sites and more! Multiple evidence-based research studies and health authorities have warned of the direct link between healthcare provider fatigue and sentinel events, including mortality of patients as well as providers. 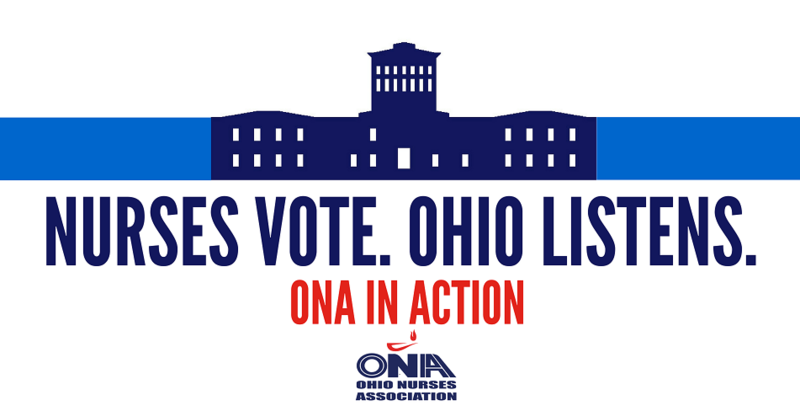 Would you support legislation that supports nurse safe staffing, and therefore patient safety, in Ohio? Do you support House Bill 456 – the bill currently in the legislature that would make Ohio the 19th state to prohibit the practice of requiring nurses to work overtime when no emergency or disaster exists? What is the one item you feel is important in improving patient outcomes in health care? How have you or will you support the identified item? Nurses who have collective bargaining agreements have a platform to work collectively with their employer to advocate for patients, enhance patient safety and ensure a safe working environment. Do you support the nurse’s right to collectively bargain? The Trump Administration is allowing states to modify their Medicaid program in ways that were not permitted in the past, such as a work requirement. Do you support Ohio modifying its Medicaid program? Did you support the initial Medicaid expansion in Ohio? Ohio Nurses = Empowered Nurses! Enter your information to access the Voter Toolkit now!